It was a few years back when I last spent some time in Vienna with my family. The week was full of concerts, operettas and plays…….it was the Musik Woche in Vienna……..
A childhood friend had telephoned to meet him and his family in the Wiener Wald Kaffee for an afternoon of reminiscing and catching up. It was a time of nostalgia – as we remembered our youth and at the same time we exchanged our happy times that we spent with our spouses and children…..life had gone on…..to be better and more fulfilling. When the pastry cart arrived my eyes simply overflowed with delight and my heart beat a little faster. I simply could not make a choice from the selection that I saw in front of me. I really wanted a bite of every one of the most beautiful pastries I had ever seen. My friend suggested the Sahne Torte. It was a huge slice and I knew I could never finish it – even with the help of the cup of coffee. The first bite was heaven! I closed my eyes, and just sat with my mouth full of this most delicious cream that melted in my mouth…slowly, making me taste every drop of whipped cream, smooth cheese, vibrant vanilla, lemony lemon juice and, every crystal of sugar. It took me a while to swallow all this goodness. As I relished this most profound experience, I found myself taking one bite after another and soon finished the huge slice that I thought was too much and too huge…. before I had the first bite. Every evening on our trip I was studying this beautiful cookbook and could not wait to get home to start translating it from German into English. But, not only the language had to be translated but also the measurements of the ingredients. It took me many trials……but, now I have this most incredible pastry recipe in my files…..executed in an American kitchen. My husband and son claim the Sahne Torte to be their most favorite pasty of all the other recipes that I have translated from Austrian cookbooks. And I hope I will surprise my husband with it tomorrow on…..Father’s Day! Kaesesahne Torte is wonderful! Be sure and use quark and gelatin as required to make it hold. Mary-Anne – I use “Unsalted Small Curd Cottage Cheese” instead of Quark, since I cannot get Quark easily in the stores here in Maryland, USA………..and of course one uses gelatin to hold it all together. Maria, you never cease to amaze me, my mouth is watering for that delicious cake, and what you did with the peonies shows your artistic ability. This sounds wonderful! Any chance you will publish the recipe? Quark is readily available in all Middle Eastern markets plus Pakistani markets, Turkish, Eastern European, Russian, etc. If you google Kaesesahne Torte recipe there are some very nice ones online. I make a couple of different types. One I learned when I lived in Salzburg years ago and the other is from my son-in-law’s mum who was a chef in Croatia for 18 years before they imigrated to the US due to the civil war in the former Yugoslavia. This region is famous for desserts! Each region has their specialities. At our daughters’ wedding the Yugoslovian ladies brought their specialities which were placed around the “official” fresh floral adorned tierred wedding cake. This is the custom also at parties. AWESOME! One of my favourites is a cake from Bosnia-Herzcovina which has prebaked merignue plus caramel in the cake. When you bite into it there is the contrasting crunch of merignue and creaminess of caramel. Love it! Another favourite is “River-wave” Cake (Dubrovick) or Metre Cake which is chocolate/vanilla cake swirled with sour cherries, then a rich custard layer, then a soft chocolate topping. The Metre Cake (Serbian) is made in a checkerboard pattern of cholate/vanilla. Mary-Anne………I am from Croatia and have learned to bake from my mother and grandmother and later on from all the Croatian and Austrian cookbooks I have collected in the past 20 years or so. 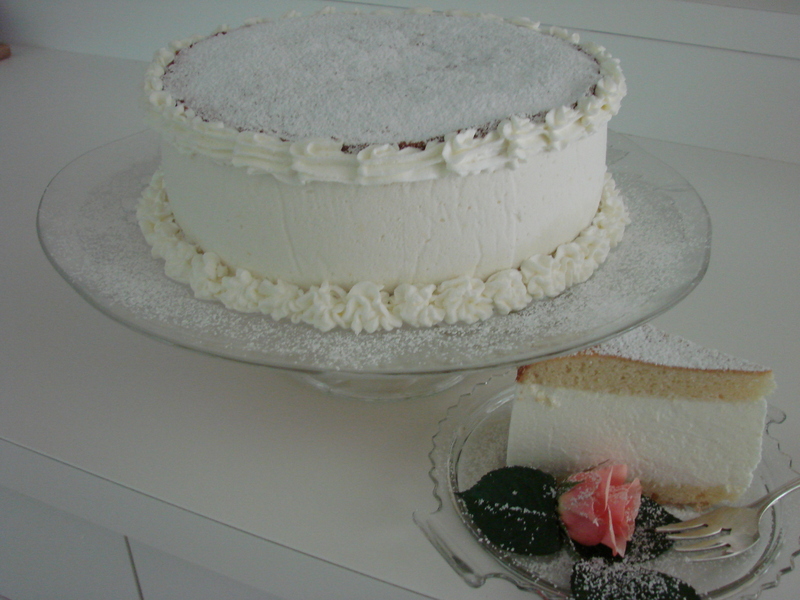 I know that there are many variations of the Sahne Torte, but the classic one is the one I make. My cousin and his family is visiting at this time here in the US and when I told them that I had made a Sahne Torte they looked at me sort of strangely and I was told that they eat this cake quite often, since an aunt makes it for them all the time. When they tasted my cake – they all agreed that mine was far superior to the aunts…….I think they were sincere – because they each had two pieces and the children all had more than that….this large cake was gone in no time at all. The tradition about the women from the “Croatian Villages” bringing cakes to a wedding is very familiar to me……and each one of the women will out-do the other…..it is fantastic what these people can make – and all without any recipes, because these cakes have been handed down from one generation to the other. I have a feeling you too are a fantastic baker…….I would love to meet you!!!!!!!! Where do you live in the US…. or in Europe? It would be fun to bake together!!!!!!!! PS…..I know that Quark is available in specialty stores, but since I teach cooking classes I have to find products conveniently available to the students……..they are not willing to go miles to find a specific item far from their homes. No wonder you are such a fabulous baker! I think the women of the former Yugoslavia are simply the best bakers in the world. Their recipes are so unknown outside Europe or even within Croatia, Slovenia, Bosnia-Herzcovina, Montenegro and Serbia. In the former Yugo there is not so much easy transportation like trains, and folks are born in a village and often stay in that area for their entire life. Of course today it is changing and after the last civil war many have relocated. Yet roads are narrow 2 lanes over mountains through gorgeous scenery and many do not drive. We plan to travel there again w/daughter and family in June/July of 2011. Montenegro is our favourite region where our sil was born. Our son-in-law’s family left their family farm of over 400 years (61 Kilometers south of Zagreb) and now all are here in the San Francisco Bay Area via Kosovo. They spent three years in Pristina due to the family being “mixed” as was common before the civil war. I delight in the church festivals when all the women bake their best and cook their sarma, etc. YUM! And the fun music, singing and dancing is fabulous. I use to bake a lot when our kids were home, but now do not bake much as it is just the two of us. Our daughter is now the official baker in the family as she learned so much while attending language school in Toulouse, France living with a French family, and now married to a guy from Yugo she is learning their family recipes! Do you make Lapinja? Love this chewy flat bread that is eaten with cevapcici. I think the wood fired ovens in the villages makes the difference in flavour! Hi Mary Ann………… I wish I would live in the SF area……..I used to before I was married…….actually I worked at the – then called – Children’s and Audult Medical Center – where I was a Medical Research Technologist in Haematology and Immunology. We were immigrants in 1951……and lived in Los Angeles where I grew up and finished college. I loved SF and often went to Walnut Creek where friends also from Croatia lived, Where exactly do you live East of SF? It would be so much fun being with all these Croatian people, I could refresh my Croatian language again. I do speak and write German fluently, since I am part Austrian on my mother’s side and we had lived in Austria for 7 years in Refugee camps before we came to the US. My father was from German, Swabian heritage and went to Zagreb University. We lived in Veliscovci near Valpovo…….and the big city nearby was Osjec…. this was all in Slavonia. I was born in Belisce. It is so nice of you to have written all about your family and your travels in Yugoslavia and all its different parts. I have not been back to Veliscovci, but have received photographs from our home from friends who have visited there. Maybe I will still have the opportunity to go there some day. I have just finished writing a book about my life and stories about my family. I am not sure that I will publish it……. (I am thinking to self-publish) Mainly for my son who not too long ago said to me: “Mom I did not know you lived though all of this.” I begged my father to write our story……but, it was too painful for him…. then I asked my mother who lived with us for 14 yrs here in Baltimore, MD after my father passed away, and she too did not write about our flight from Tito…….and she died at 94 yrs old 3 yrs ago. And it was at her funeral when my son was surprised when he heard people speak about our experiences during and after the war……….I knew then that I had to write it down…..all that I could remember. He is now married and has a 3 yrs old little girl and a second child on the way…….I am called Omi – that was how my mother was called by all her 8 grandchildren. My brother has 7 children and many grandchildren already. I had only 1 child. Oh…….when I lived in SF I used to go to a place where they danced all the circle dances…..and learned to dance different colos………..I loved it !!!!!!!!!!!! And I can cook Sarma as well! I love it too……my husband being American does not like anything with Sauerkraut…….so I make it and freeze it in portions and I eat it for lunch when he is not at home…….and so it is with many other dishes that my mother cooked and I love. When I started teaching cooking classes – for the first two years I taught only family recipes………and have a whole collection – which I want to put together into a book as well. It would be interesting to try it out and see if the homemade quark produces a different result in your Sahne Torte recipe. If not, there’s no need to go to the trouble to make it or find it in international food stores. ( first it was fresh from the farm and then in later years from the store ) and the plate/lid was place on the pot. It was left at room temp. for at least 2 days (longer in the winter months) and thickened all on it’s own. We would spoon it out and sprinkel it with sugar as a treat and sometimes (when Grandma was making cheesecakes) she would poor it through a cotton towel to make Quark. By the way…..Quark stired smooth (like sour cream) with a little cream or milk if you don’t want all the cals and a pinch of salt on top of a toast with jam is heavenly. Ursula……….thank you for your nice comment. I remember my grandmothers making Topfen…..that is the Austrian word for Quark……the very same way as your grandmother made her Quark. I have made it that way as well…..but, for the amount of Topfen one needs for the Sahne Torte…….it would take some time to make enough for the this recipe. Therefore, it is easier to buy cream cheese and some unsalted cottage cheese and blend them in a food processor to make the kind of Topfen one needs for the Sahne Torte. I will post the recipe in one of my next blog entries…………. 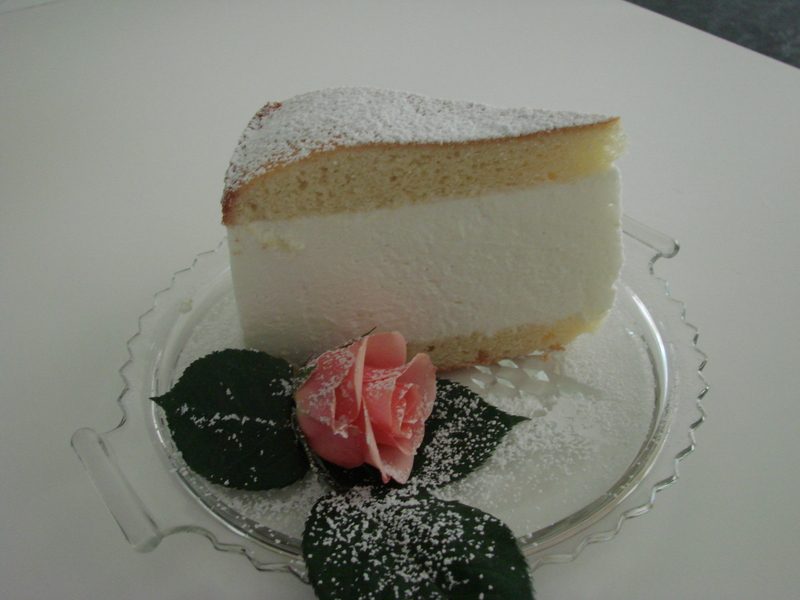 i have the receipe for the Kaese sahne torte, but it doesn’t come out the same as when i made it in GERMANY. We can’t buy the Quark here in the uSA,therefore it doesn’t come out right.Any other suggestions ??? and please put the amount of whatever it takes to make the filling. Hi Betty……please, go to my Kaese Sahne Torte post of Sept. 2012.. you will find it on the right hand side of the blog, click on Sept. 2012……there you will find all the ingredients and how to make my version of the Kaese Sahne Torte…. Let me know how you like the one with my recipe…I would love to hear from you….